After not having enough Asparagus last year, I have maybe gone out of my way to ensure I get some every weekend this season. But I also really wanted to utilise my barbecue on another semi-fine day, so decided to try and do some mackerel. So far, the only time I've cooked fish on my Weber is either in a paella, or using fillets on a cedar plank, but this time, I wanted to try and do a whole fish, straight on the grill, using direct cooking. I'm far more comfortable with more slow cooked barbecue stuff, although using my phone for a count-down timer, I've got better at not overcooking things that just need minutes and seconds, or at least need to be checked every couple of minutes. I'm not sure I've ever cooked a whole fish before, be it on the barbecue or anywhere else. I normally get my fish filleted, or when I have cooked something with bones in, it hasn't been the entire fish. But, having read up on a number of mackerel recipes done straight on the grill, I thought it was about time I gave it a try, especially as it's cheap enough that if I messed it up first time around, I could easily go out of buy a couple more to try again. A number of places talk about having your grill squeaky clean to do this. I'm guessing this is for people that don't use their grill much. Personally, I clean my grill by getting some hot coals under it, closing the lid for 15 minutes or so, then giving it a good brushing with a decent, wire grill brush. I'm sure a perfectly new, squeaky clean grill will work really well, but it doesn't have the character of one that shows real use. It's like woks. The blacker the wok, the better the chef. But like also like woks, just because it's black, it doesn't mean it should have large amounts of grease, and leftover foodstuff hanging to it. This recipe was good for two Whole Mackerel, a really good value, but nice meal for two. Mix all the marinade ingredients together. Adjust amount of lime, honey and fish sauce to taste. If too salty, add a little more lime juice. If too sour, add a little more honey. Balance to taste. Maybe add some finely chopped Fresh Parsley too. Make 6 deep slits on both sides of the Mackerel with a sharp knife. Massage the marinade all over the fish, into the slits and the body cavity. Wrap them in cling film, and keep in the fridge for 20 minutes or so while you get your barbecue going. 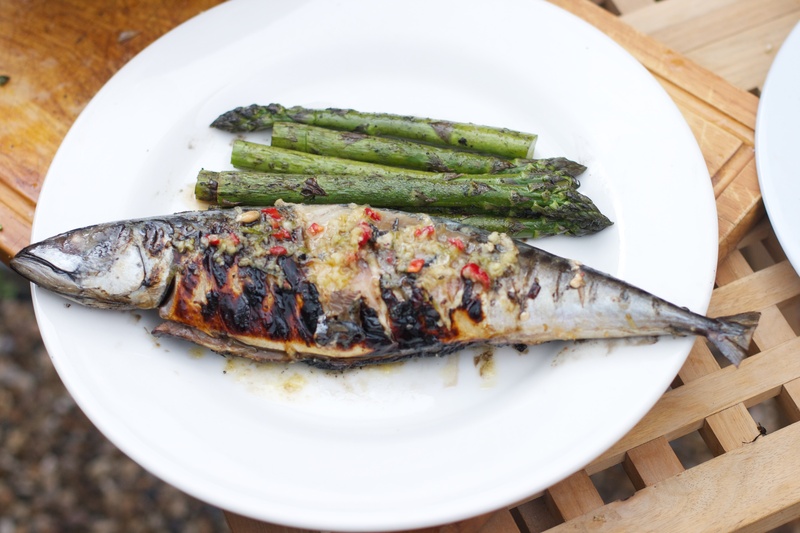 Keep any remaining marinade to drizzle over the Mackerel after grilling. Cut away any woody bit at the end of the Asparagus. If it's in season, fresh and local, there shouldn't be much to cut away at the base. Rub in Olive Oil, then season with Salt and Fresh Ground Black Pepper. Keep aside to grill towards the end of the Mackerel cooking, or while the Mackerel is resting. Get your barbecue (grill) ready for moderate direct cooking. Depending on your lighting method, this could take about 40-45 minutes to get the coals to their optimum. Ensure your grill is as clean as possible. A lidded barbecue (such as a Weber kettle barbecue) helps to ensure coals don’t flame up too much as the marinade and oil drips from the fish. Place the fish on the grill for 5-6 minutes per side, only moving when turning over. When done, the eyes should look milky and the middle of the fish should be warm (about 52-55°C near the spine with an instant read thermometer, or fairly warm, but not burning to the touch). Leave to rest for 2-3 minutes. While the fish is resting, grill the Asparagus, turning fairly frequently. Again, use the lid to calm any flames from small amounts of Olive Oil dripping on the coals. 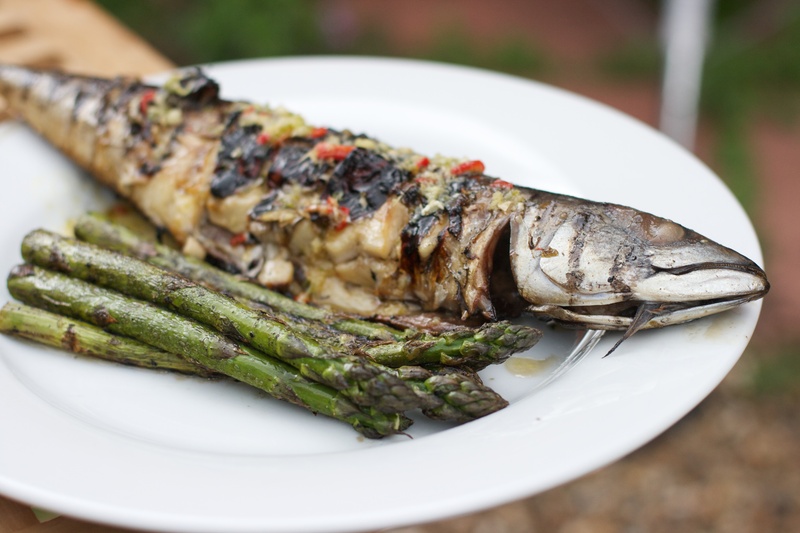 Serve the Mackerel with the Asparagus, drizzling any remaining marinade over the fish.